WHY DOES MY SLIDING PATIO DOOR SCRAPE AT THE TOP AND DIFFICULT (if not impossible) TO MOVE? When a new home is being built, an opening is often framed out for the sliding patio door assembly. But, before it can be inserted into the opening, a substantial “header” support beam is placed in the wall above to prevent the weight of the second floor or roof from putting pressure on the door as the house settles. Years ago, this was a steel I-beam. You will often see the edge of the steel beam on the outside of older brick homes just above the door. 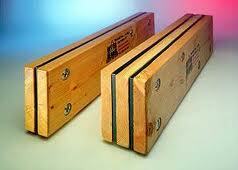 In recent years, a heavy timber has been used… or a pair of 2” x 12” planks. These are an expensive part of the whole job as these wooden headers can span anywhere from eight feet to fifteen feet in length… or more. When large housing developments or sub-divisions are being erected and hundreds of homes are involved, a contractor can save thousands of dollars by cutting a few corners. And, a common area to reap savings is in the header beam. Four to six smaller sized beams are considerably less expensive and can be concealed in the wall before the building inspector makes his next round. These smaller sized beams, even though they take up the same space, are much weaker than the solid timbers specified by the architect. So, a few years down the road, as the house settles, the header begins to sag to the point it rests atop the sliding door assembly. The sliding door then begins to drag under the weight. And, scraping marks can be seen on the under-side of the top track. Eventually, the door will no longer move at all. The most cost-effective solution to this “sagging header” problem is to remove the door and plane a ¼” off the top of the door. This can be accomplished whether the door is wood or metal. This will give many more years of “life” to the patio door system since the fixed sliding door panel(s) will provide supplemental support. If the door is an older Pella, a router may also be needed to deepen the center channel. In any case, the nylon guides will need to be set deeper. Sometimes, just resetting the guides may do the trick without the need to plane. Sliding patio doors do not seal at the top of the door. The weather seal is on the sides of the upper track, and there should be about a ¼” or more of space above the door. This space allows the door to be lifted off the lower track for service. In situations where the upper track is resting on the patio door, removal of the door may require a “floor jack” to lift up the header enough to get the door out. The sagging header problem also puts more weight on the wheels (rollers) built into the bottom of the sliding patio door. The ball bearings in these rollers will experience a shorter life and often require replacement at the same time the door is planed down. It may appear that we were solely blaming contractors and builders for the numerous sagging header problems, however, although some building contractors are surely to blame, the problem is far more expansive than just some bad apples cutting corners. It was discovered back in the mid 1990’s that the architectural standards for calculating header load were incorrect and header support beams had been typically undersized for decades. However, since 2000, with the implementation of new upgraded standards and the development of “engineered wood beams”, these situations should no longer be as prevalent as in the past. If this situation is in our home town, it’s everywhere. I don’t think our municipal building inspectors are less informed than in other communities. I think they are just ignoring the issue and think it’s no big deal.